Anyway. Our table was towards the back of the dancefloor, and while we danced away the time until the band appeared, I noticed a slightly melancholy-looking man sitting alone at a table at the end of the room. I cabaceo-ed him, and we danced. He was a nice leader, steady, smooth and unflashy (unlike, for instance, the idiot who, on our first visit here, wound up our tanda by whipping me into a life-threatening back-bend. 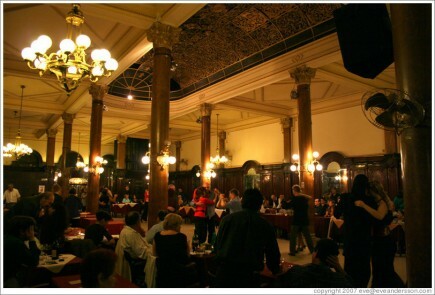 Or the chap a week later, at Porteno y Bailarin who propelled me onto the empty back dancefloor and, as part of his intimidate-a-foreigner repetoire, sat me on his knee, then, as we walked back to my table, shrugged and said, "Mas o menos". Porteno y Bailarin, by the way, has used shoes lined up on the low wall between its two floors: they are bound for tango dancers in Cuba. But I digress). Claudio, the melancholy man, was Italian. I have no Italian, and he only rudimentary English, so when the tanda was over and believing him to be rather lonely, I invited him to our table with the express purpose of introducing him to C, who speaks a little Italian. So there we were, Claudio and I with our backs to the dancefloor, M and S gazing up in a welcoming manner from the table, and C extending her hand, when I became aware of something bearing down on us with all the unstoppable weight and intent of a steam train. It halted inches from Claudio. "This is my husband!" it announced in stentorian tones. "Nice to meet you," I said, giving it the benefit of the doubt in spite of this unorthodox greeting. It ignored the hand. "This is my husband!" it repeated. "When I dance with other people, I tell them I am married ..." And she turned accusingly to Claudio. He had picked up the alarm signals quicker than me, and by now he was hanging his head with his face was turned away from our table, a position from which it never returned throughout the exchange. "I brought him here to introduce him to my friend who speaks Italian," I explained, indicating the hapless C. Hers and the other jaws at the table had now dropped as far as they could go. Claudio's wife was - there's no nice way to put this - bad bottle blonde, with a lumpy miserable over-madeup face. I've tried since not to discount the theory that Claudio might, at various points in their marital history, have given her very good reason for this stern level of oversight, Yet even if that's true, this was probably not the most productive way of handling it. Surely such public humiliation would drive a man into the arms of another with all speed. "You can introduce him to who you like," Mrs Claudio continued, steely-eyed, "but I am just clarifying - he is my husband!" Her grasp of English was impressive, and finally I got the message. With a two-handed gesture of surrender and possibly even a shrug, I said, "I just came here to dance," and retreated to my seat. Claudio was now frog-marched back to his solitary table where he was given a bracing disciplinary lecture and once more abandoned. Mrs Claudio went back to her own table, which wasn't so far away that she couldn't monitor his activities, and spent the next half an hour snacking angrily. For the rest of the night, Claudio stared mournfully at the dancers or played with his cellphone. I never saw him dance again.